Tired of stodgy corporate games made by The Man and his minions? We're playing the 31 best indie games for a change of pace —- and so we can judge them. Today, Limbo. This is the unsettling and deviously well-designed side-scrolling adventure of a boy set in a quietly hostile black-and-white world, with Super-Mario-simple mechanics. Development studio Playdead announced just this week that the game is scheduled for an exclusive launch this summer on Xbox Live Arcade. 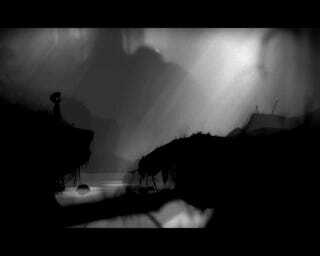 Nominated for Independent Games Festival awards honoring visual art and technical excellence, Limbo could just as well have been pegged for best game design. The side-scroller gently and cleverly doles out puzzling challenges. A plant drops onto our young hero's head and suddenly he can't stop running until the trick of killing that plant is determined. As our hero runs to the right, he suddenly must stop. The long stabbing arm of a spider that has been stalking our hero bars further passage. But a tossed bear trap might provide a jagged solution. But the game's atmosphere — magnificently distinct, lovely and disturbing all at once — does trump all. The game feels like a quiet nightmare rendered in ghostly black and white. It feels less right to say that the game is populated by enemies than it is to say it is haunted by them, haunted with the presence of vicious nature and by some children who seem to have nothing but violence intended for our lead character. The game, so far, is a beautiful and clever terror anchored by a sharp used of physics and Nintendo-style layering of basic game mechanics and puzzle-solving strategies.